When you're coming back from a long day of college classes, the first thing you want to do is relax and sit in some comfortable dorm seating. The most comfortable spot in your college dorm room is going to be your dorm bed, of course. After all, your other dorm seating options are your dorm desk chair and dorm floor, neither of which are very comfortable. Unfortunately, while your dorm bed is going to be the most comfortable place to sit in your college dorm room, you won't have the study surface that you need. A lapdesk like our Snow Bunny Lapdesk is a must have dorm item so you can have the study surface you need while still relaxing in a comfortable spot. Our Snow Bunny Lapdesk has a fun design that makes this dorm essentials item more than just a boring, basic lapdesk. 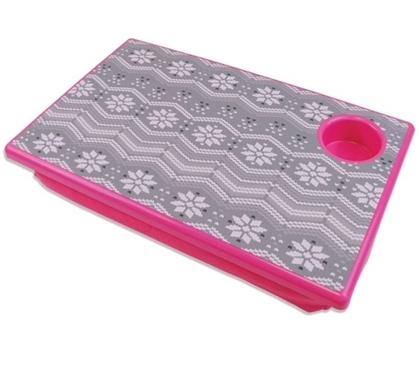 This dorm necessities item has a cute gray snowflake pattern on the top while the rest is a bright pink color. This dorm item even has a cup holder indented in the surface for your bottle of water or if you don't have a drink with you, you can also use it to hold your pen, highlighter, or iPod. On the bottom of this dorm essentials item is a cushion so you don't have to worry about setting a hot laptop on your lap and also so your book, tablet, or laptop is slightly elevated for greater comfort.